Resources and guides related to building a rain garden. You may also want to check out our Maps and Tools section for map tools that provide detailed area information on soil drainage and stormwater. 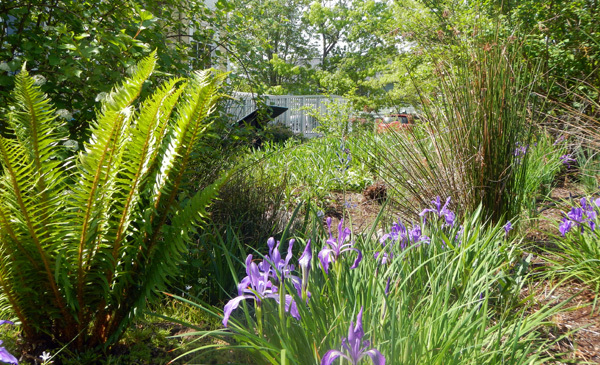 Rain Gardens brochure – an introduction to rain gardens! For printing, print this file 2-sided with “top bind” binding, then fold the printout widthwise. Maintaining Rain Gardens, Swales and Stormwater Planters – this document contains more technical information for landscaping and maintenance, particularly for bioswales and green street features. Online Rainfall Volume Calculator – this online tool can help you figure out how much runoff your roof (or other impermeable surface) receives. It provides results in English, metric and other types of units.